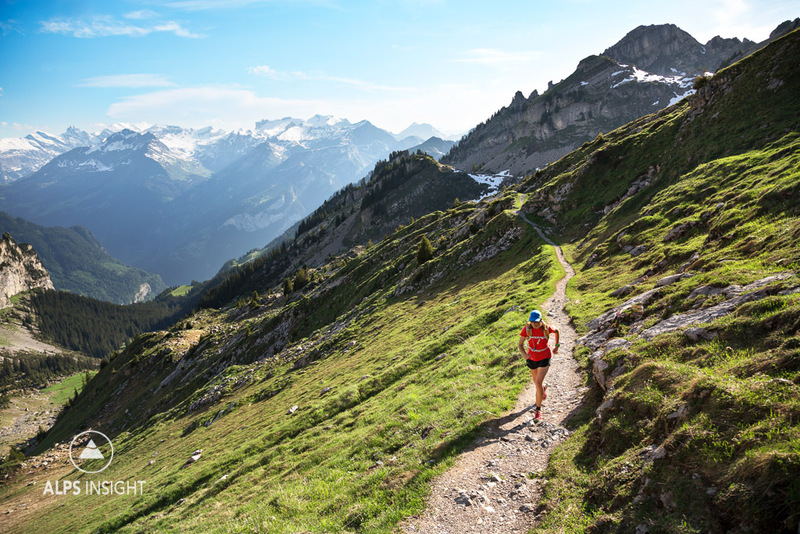 Trail runs in the Swiss Alps are often little journeys through different places and zones. 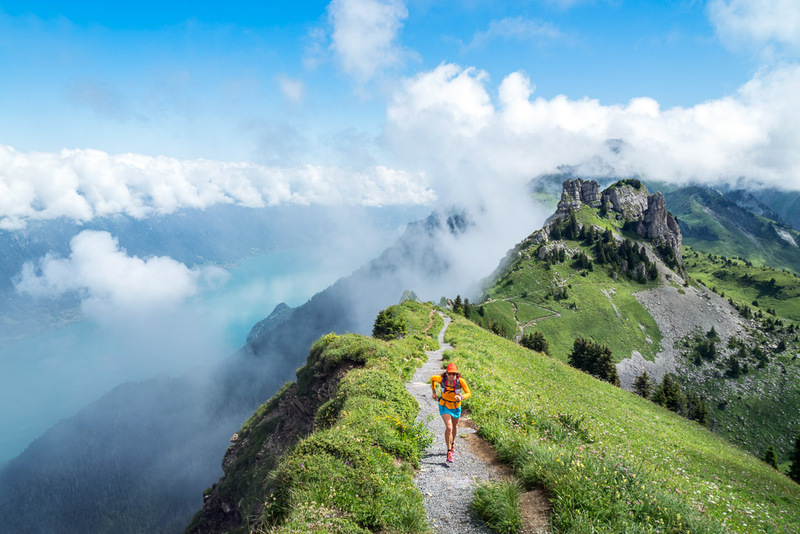 As you start upward from Wilderswil for Schynige Platte, something more than a journey kicks off, a kind of trail running odyssey begins. Seriously. 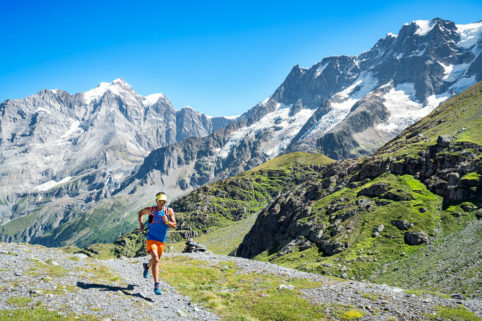 If there is one run to do in the Berner Oberland, this is a leading candidate. First, the unrelenting 1500 meter climb through thick forest - forest you ache to get out of. You know what view awaits so you push your legs to speed you upward, to get that forest behind and below, until you finally turn a corner and literally find yourself standing on the Schynige Platte's restaurant deck. And now the run begins! The next 10 kilometers are about to be a true lesson in managing your feet while staring at the views. To your right is the Jungfrau Region skyline, including the famous Eiger, Mönch, and Jungfrau. On the left is the turquoise Brienzersee with the Hardergrat rising above. Thankfully, footing isn't so difficult, this is a very popular and well worn single track. The run includes a hut stop at the Berghaus Männdlenen. While the hut is situated perfectly for water and food, it might be one of the only huts in the Alps without much of a view. Nevertheless, the hut keepers are very nice, often have some locally made cheese and sausages, and help keep you from having to carry much in your pack. Stop and enjoy the offering, but not for too long, you still have some work to do. From Männdlenen you'll begin the traverse towards the Faulhorn, the highpoint of the tour at 2681m. 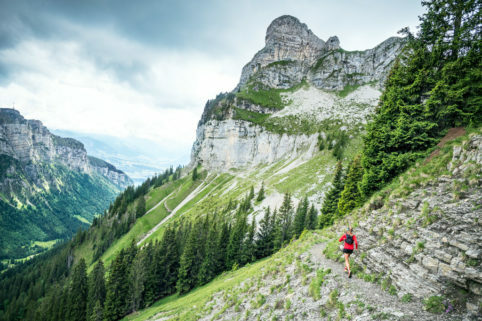 Climb to the summit or take a shorter option on a low trail that bypasses the peak. From the Faulhorn, the quad pounding descent begins to the Bachsee (see Instagram for a plethora of amazing views) At First, the gondola station, you can call it a day if your legs don't have another 15km in them. Tempting... but, continuing has some rewards, plus you have an odyssey to complete. 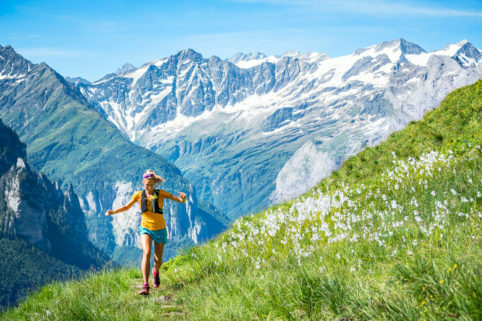 You'll get to enjoy a 7km rolling traverse while taking in most all the major peaks and glaciers of the Berner Oberland. 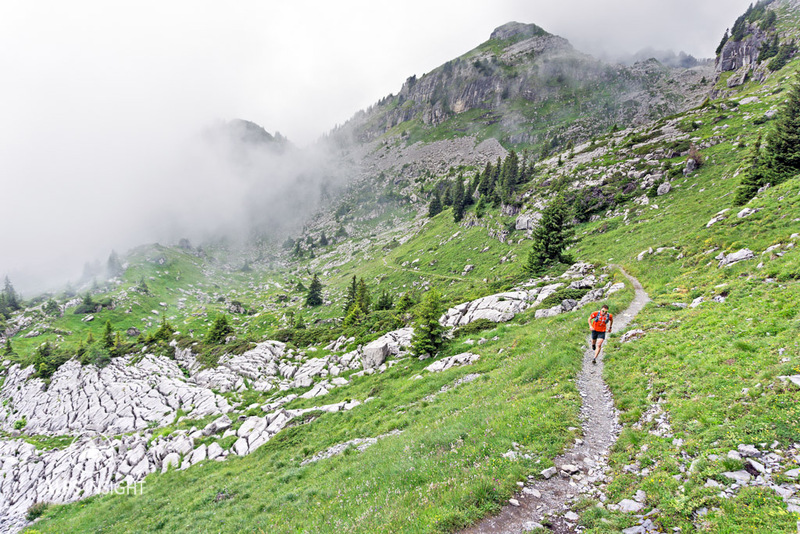 The traverse ends at Grosse Scheidegg, the pass where the descent trail begins for Grindewald. It's here you really understand that you have moved through some varied and beautiful mountain terrain...and that it's been a long day that you'll never forget. 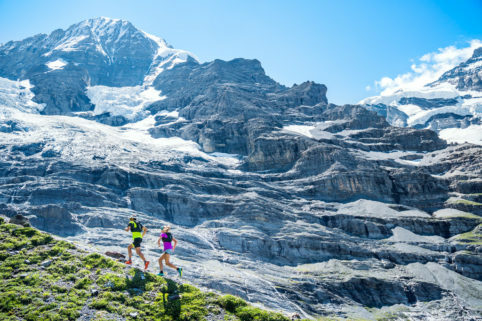 Don't miss the other Jungfrau Region runs: The Hardergrat, Lauterbrunnen to Grindelwald and Lauterbrunnen Obersteinberg. Consider the options for food and water. You'll have three well placed restaurants for spending your Swiss Francs. Take advantage, it's likely you'll also want the breaks. There are multiple opportunities to shorten the day. First, skip the big climb from Wilderswil to Schynige altogether by taking the old cog train up. Next, at the First gondola station, you can head straight to Grindelwald. And at Grosse Scheidegg, the Swiss PostAuto buses service the pass all summer. Hop on to avoid the 900 meter descent. Leaving the Schynige Platte behind for the wide open landscape before the Berghaus Männdlennen. 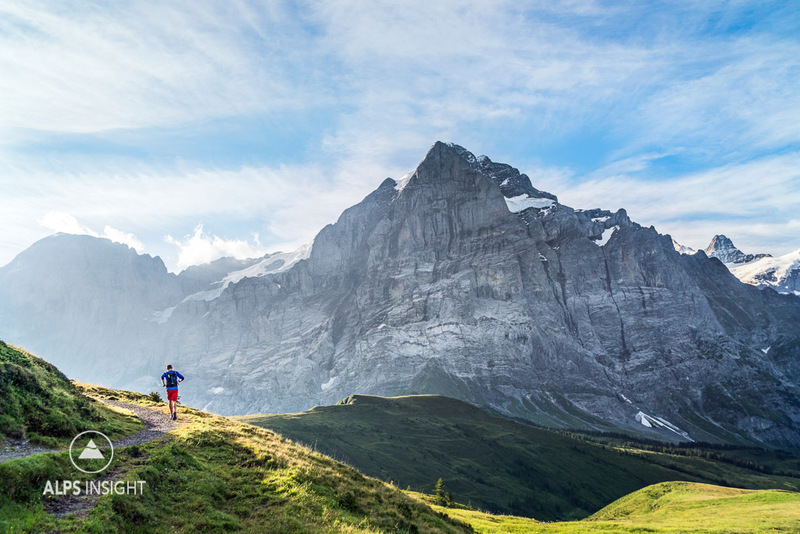 The high peaks of the Berner Oberland are nearly always in sight. 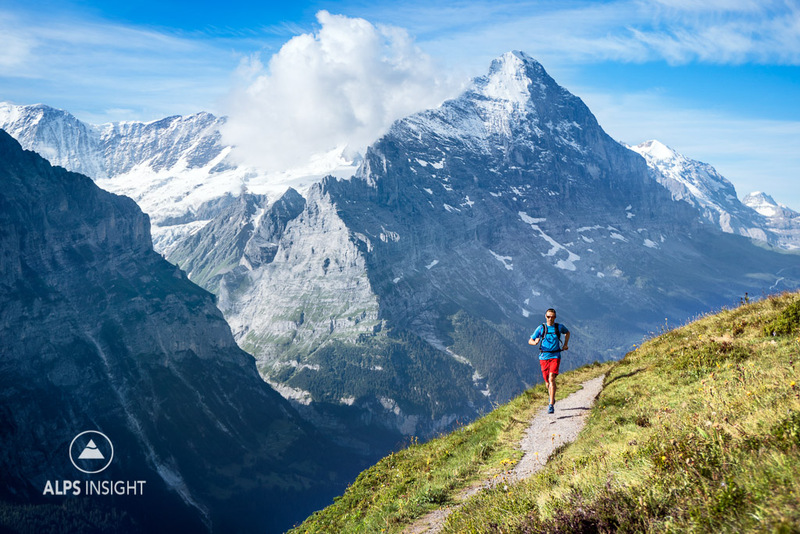 Ueli Steck cruising some of the Jungfrau Region's best singletrack. 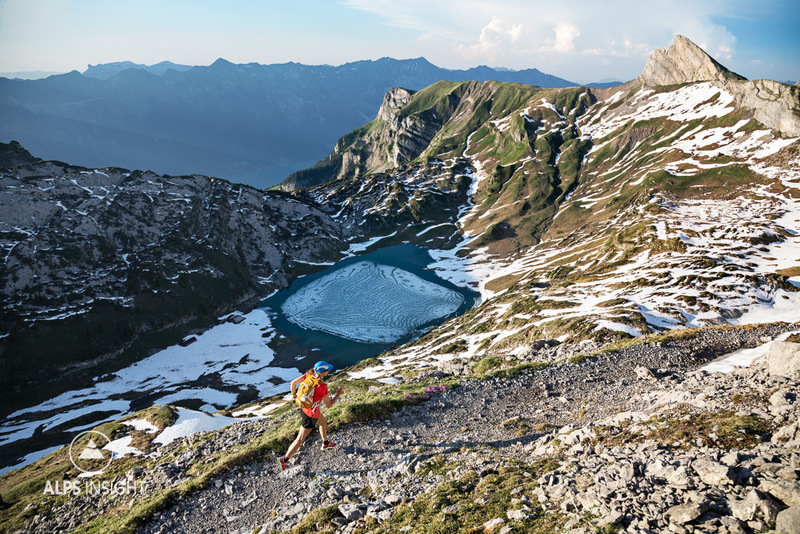 Traversing high above the still ice covered Sägistalsee in early summer. 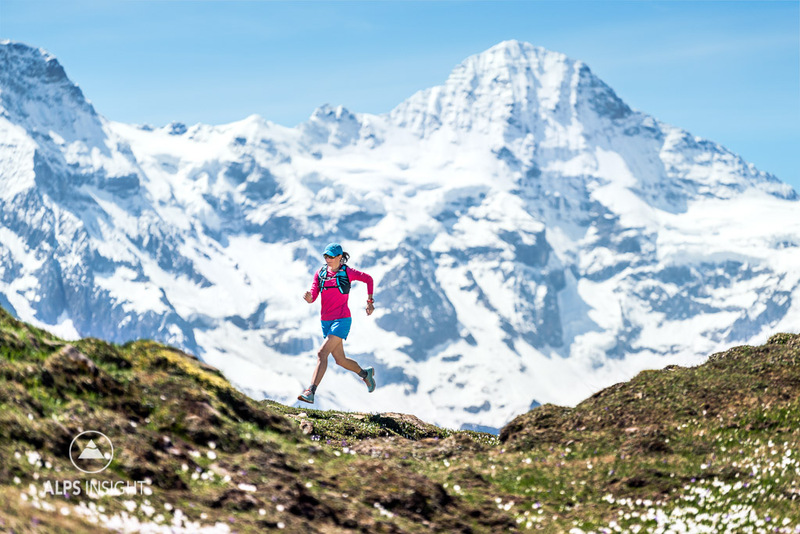 With the Eiger Nordwand as entertainment, Jan Pyott is on his way to Grosse Scheidegg after passing First. The Wetterhorn marks the end of the traverse from Schynige Platte. Directly below the wall is the Grosse Scheidegg, where the trail drops to Grindelwald.